This is a collaboration piece written by myself and the talented Amanda Danker from Team DemiGods for the 'Postcards for Mount Olympus' event on 18th December 2016. This piece was inspired by our opposing states of who were are andwhat we are expected to be age wise. Your community that is of a certain age and type. in jungle gym politics, cafeteria cliques and hierarchy of expensive toys. Mature (noun) Fully developed physically. but I am an old soul. will pick me up with their wings and worries. Like a child I will be carried. Life does not come with instruction manuals but as we go through Life, we learn lessons and keep progressing to move forward and upward. May we continue to have hope and believe in ourselves to build a better tomorrow. Merry Christmas and Happy New Year! "Be the change you want to be." "See things beyond what is before your eyes." "Diminish in yourself so that you may increase." "Even the smallest effort leads to big effects." I. You asked me when my God had died, I said, "Why, on the day of Atonement." Yet we both knew, that deeper still, the question lay unanswered. You asked me when my God did rise, I said, "Why, three days after Calvary." The answer came as winsome as those Sunday mornings I did not go to church. You asked me who my God had saved, I said, "Why, sinners all around us." Straight in your eye I looked, but saw no damnation there. You asked me when my God had come, "Why, Christmas Day - but you knew that." When would He come? "No date is set." Will I be there? "I do not know." Will you be there? "I dare not go." II. You asked me when my God had died, I should have said, "Why, when I lied Lied that I believed in Him, While in my heart I knew not Him." You asked me when my God did rise, I should have said, "I must admit, Admit that though they say He did, I struggle to believe in it." Faithfulness is maintaining the trust that we have built and keeping it strong no matter what gets in the way. It is what keeps the momentum going and the depth of the relationship growing. Loyalty is to put you as my priority One and only one to fulfill me You and I will build a life that is solid Away from you I will not stray Live by your side even when you are invalid Trust in you whole-heartedly, You will be my net of security. SY is a 'Jacqueline of all trades' who loves wearing plaids. She doesn't believe in things that fade and fulfills the promises that she made. She seeks the hearts of the troubled, to be a listener in times when things are doubled. She's the kind who stands in the gap, who will only call it quits when it's a wrap. Along the alleys of Keng Kwee Street, Where tourists flock to beat the heat, Resides a bustling hawker stall, Serving a local delicacy called 'chendol'. Rows of people queuing messily, Calling out for the attention of the aunty, For bowls of chilled, sweet simplicity, To have by the roadside in all its glory. Cubes of ice floating buoyantly, Cooling down the white silky sea, Green slippery strings swimming about, Springy and sliding in and out. The bowl is dressed like an icy dream, Lined with satin white coconut cream, Stitched with threads of gelatinous goodness, Stained of rich brown sugary sweetness. On the 25th of October Larry Yap posted a status that had a nice ring to it. 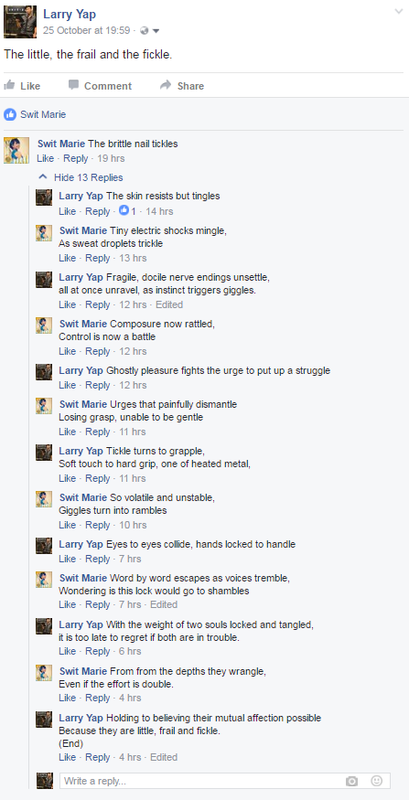 So, I decided to reply with a rhyme and one line led to another. When the day was over, we had a really cool collaboration between #Simple Words and the Muruku Murmurations. 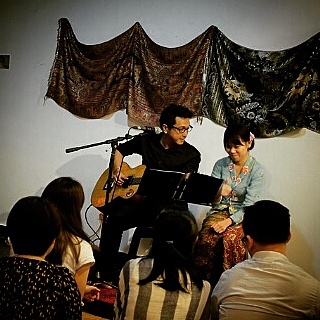 This collaboration was performed at 'If Walls Could Talk Open Mic' on the 5th of November 2016. You can watch the recap of our performance and read the original post here. Some slight edits were made as we practiced. I am truly thankful, blessed and honoured to have this experience; writing and performing with such a humble and talented person. The brittle nail start to tickle. Control has become a battle. It is almost the end of the year and there was a lot that has happened since the birth of 'The Muruku Murmurations'. Welcome to a fresh look and feel to the blog like freshly fried muruku right out of the wok. .
'The Muruku Murmurations Issue #1 Zine on display at Zine Canteen hosted by Odd One Out Magazine at Awegallery. Unfortunately the zines were sold out and it was a collective decision not to have any more reprinted. With that said, I will be working on new material and publishing my own zines next year. I am looking at having a special issue for collaborations and guest murmurators if they are interested. 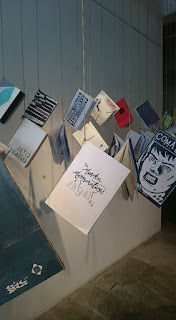 Proceeds of the zine sales will be used to fund a new project called, 'Poetic Art Around The World'. Can I close my eyes And still know that you are there, When I take a breath Will I still know that you care. Can I make a stand And have you there beside me, When I reach out my hand Will yours be there to catch me. Can I take a step back And see that you are steady, When I make a leap forward Will I know that you are ready? Across dreamlands; green belts that stretched throughout the gracious pastures. Golden painted sky on the horizon's canvas and frolicking cotton clouds licked by mortal eyes that were in awe. There in the distance, I saw you. A stranger with words and heart that had silently spoken out loudly to me; you whom had written across the dreamlands: pictures of mysteries; language of hidden poetry. You had written art and left it for me to find them all across the dreamlands – the vast continent of slumber and awake. I knew then that I had to know you now, the one that had crafted the dreamlands; calm and tender soul, a place of truth and humanity secrets could hold. You, across the dreamland, I had dreamt of meeting you. And I want you to know; I am halfway there – bleeding – fingers making sentences to cut the distance, with my words and thoughts, still bleeding. My heart has found a home and my home has found a heart, a place for comfort and belonging. A place to comfort and belong. My home is being in your arms, Embraced in warmth, On your chest I will rest Wrapped in your blanket of security. My smile is sculpted by your charm, Humourous jokes that you crafted Etched into my long term memory Conversations that lasts for hours Your thoughts are what I can afford, Your happiness is my reward. My dream is slipping away From consciousness, Fall into a solace of slumber From January till December. Discovering dreamland together, Where you and I will be In each other's comfort, Where our eyes meet with ease. My home is where your heart is, Making my life in sync with yours, In unison to our heart's beat. I thought I was good at math before I met you. Now x is no longer an unknown to be found but a mystery unraveling. The circumference of a circle cannot contain all that radiates from this centre. And one plus one now equals infinity. After months of recuperation and losing my definition, time and time again being asked who am I and what I want. This piece would be an expression of my entity, who I am and what want to be. I am a female ball of enthusiasm Soaring and cascading with fanaticism For all things pop cultural and traditional All I want is to be original Not a carbon copy of the girl next door Nor the outline of what was done before Travel down the road less explored A pioneer of innovating things that I adore. I could not be bothered by temporary non-necessities Fallacies, twisted tensions and false realities, What you call fab, To me, is a drag. Show me its worth and substance Then, you have every right to brag I cannot tolerate air and cotton candy Too sweet without the sour, bitter and salty. how thick the thread is. We chose what color we desire. winding to make balls of thread. how excited we were this morning. or if we had breakfast at all. without the promise of rain. in my mouth,’ auntie said. She would spat them at their backyard, after. length of threads and ties them together. So it is not sayang. We wind to make balls of thread. Leave the cotton for the old people to make pillows. Just crack the kapasanglay slowly, carefully or you won't have a nice boat. It has been 54 years, 3 months 2 weeks and one day, Hiding behind curtains of lies, schemes, and treachery, Dawned by the eclipse of misdirection and bitterness, I live in the dark, damp, cellar of injustice, Who is counting? The days I have imprisoned myself here, I am just passing time like fruit flies, Waiting to finish it's life cycle and die, Reaping the rotten fruits of the seeds sewn by my bloodline. Let there be no sadness. As I sob uncontrollably, gasping for air and clutching my chest, let me remember that there will be better days ahead. Let there be no anger. As I bite my lip and dig my fingers deep into my skin to restrain myself from giving into the pain, let me remember kindness & gentleness. Let there be love. As I let your hand go & you take with you the remnants of my heart to do with them what you will, may you always remember that I love you with everything I have and will continue to do so from a distance. When you let yourself open up to your emotions again, chances are you can experience love again. I am thankful for recent events that has given me a reminder of the very love that I need and more importantly, the love I am wiling to give. Unconditional, unbridled and unforgettable. After writing chapters on loneliness and wanting, this string of chapter poems will be on what I need in a lasting relationship. This is an interactive piece, insert 'LOVE' at the beginning of every sentence, this piece can also be read just as it is. Each other as long as we are living. Relentlessly when we are able. Trying to sustain with valor. Is this the key to why you would not tarry? A Taytay attempt at trying to describe the many parts of a relationship with colors. Black. The remnants of my heart before you, as dark as ink that slowly seeped into my soul, turning me as bitter as the coffee I drink. Yellow. The small rays of light that slowly beamed through the cracks of despair, as you beamed at me from across the table, albeit shyly. Pink. The colour of my cheeks that I deny every time I talk about you, unable to wipe the child-like grin on my face as I recall the things you say to me in secret and say about me in public. Green. The peace I feel every time I awaken at an hour ungodly to me, yet am satiated because your face is next to mine, softly wishing me Good Morning, which is in essence the best thing about the morning. Orange. My small streaks of irrational jealousy at women on the receiving end of heart emojis that I want to claim as mine, but knowing deep down that a heart is only claimed when given willingly, not demanded. Say you're sorry. Don't assess the facts but just apologize first, so he would be mildly appeased albeit still irritated at whatever it is he has convinced you is your latest crime, on your long rap sheet of perceived stupidity. Do not look him in the eye. Always look down in remorse and submission, remembering always your place in this world and that you shouldn't be so audacious as to ever look him in the eye. October 10th is World Mental Health Day. I wrote this during the #NaPoWriMo Prompt Challenge to write about a month that is cruel. I chose the month of May as it was Mental Health Awareness Month in America. This piece is an insight go what goes on in the mind of the anxious and depressed. Find out more about Mental Health Month & World Mental Health Day! What? You have MDD? Suffering from anxiety? Give me a break... It's all in your head. Don't you even try, Attempt to talk to me, Like a lid shut tight, you pry, Using your leverage, I see. You try to understand, What is depression? Just so you can reprimand, This adjustable condition. Have you been trapped before? Suffocated and breathless, My oxygen is the truth by which you swore, But my atmosphere is lies, lies and more lies. I can't breath when everyone crowds around, Pin me to a corner into a submission, Do the count out to get up from the ground, But deep down they just want extermination. I think, the more someone cares about you the more they say your name. If you put it in a mathematical equation, they have a positive correlation. They even say it more dearly. There’s this, depth in their voices. But perhaps it’s just me. Perhaps I think so because I just want him to care about me. I want to be a manic dream. Everyone’s manic pixie dream girl. The one that people miss when she leaves the room. The one that everyone remembers as the smart, beautiful but crazy girl. The almost, but never girl. Charming you don't mean to be but you are, Surpassing all the pretty boys by far, What you are is a solid & truly nice man, Of your music & dance moves I am a big fan. The sway of your hips with your legs between mine, There is a cool vibe about you but your eyes are kind, There is no lying you give me 3am thoughts, Although I know realistically it is all for nought. I have to admit I do enjoy your gaze, And the sensation when my body you accidentally graze, But this shameless flirting is harmless at best, Which is why at the end of every Wednesday I can lay my temptations to rest. This piece is inspired by the lyrics of 'Paint' from 'The Surrogate Friend' album by Francis Wolf. Happy Birthday to you, Wolf! Thank you for your words of kindness, encouragement and love. This piece is dedicated to you. Every time you start to speak. Every time you be my surprise. Every punchline never gets old. Paint my life with your love every day.